If you are a mammal, there is a pretty good chance that you love sweet foods—so far, every mammal we have studied has shown a taste for sugary sweet treats, with cats being the only exception. Though our love of sweet-tasting foods probably helped us survive back in the days before supermarkets and fast food restaurants (the sugar high we get from these foods is a biological ‘reward’ that our brain gives us in order to train us to eat energy-rich foods), it often gets us in trouble now that we have pantries full of cookies and snack cakes. We and our pets adore sugar-laden snacks, which is why their waistlines have expanded right alongside ours. In an effort to keep ourselves healthy and fit, we search for ways to satisfy our sweet tooth without gorging on processed snacks that are high in refined sugars. For many of us, that means turning to fruit whenever our sugar cravings start up. 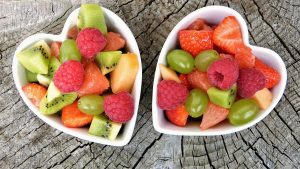 Health and fitness magazines are full of articles singing the praises of eating fresh fruit for dessert, and, with a little practice, it works. But can we do the same thing when we want to give sweet treats to our pets? Our doctors have been telling us to eat more fruit since we were weaned, but we don’t often hear veterinarians mention eating an apple a day. So, can you give your hamster fruit? The answer is yes, hamsters can eat fruit in moderation—in fact, there is a good chance that they are already eating fruit every single day! Many hamster mixes include small pieces of many kinds of fruit, including bananas, papaya, pineapple, and raisins, so your pet is probably accustomed to eating dried fruit on a daily basis. 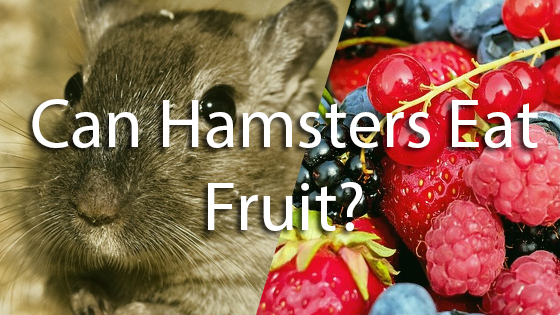 Most types of fruit that are safe for humans are safe for hamsters, too, so there is no real risk of toxicity associated with giving fresh or dried fruit to your hamster. Just remember to use fruit mostly as a treat, and avoid giving your pet any dried fruits that are covered in chocolate or added sugars. Are There Any Healthy Benefits? Because hamsters are true omnivores (much like dogs), many types of fruit, especially fresh fruit, are healthy for them in moderation. Fruits provide your pet with a range of important vitamins and minerals (which vary depending on the type of fruit you give them), and all fruits are packed with antioxidants and dietary fiber. Dietary fiber is often one of the most sought-after features of fruit. Though most of your hamster’s fiber needs should definitely come from their normal diet of hamster seed mix, they may benefit from eating supplementary fiber in the form of fresh fruits and vegetables. Fiber is great for regulating digestion—because of the way it interacts with water, it can help prevent both constipation and diarrhea. If your pet is constipated, fiber can help by ferrying fluid into the large intestine, where it softens and lubricates hard or impacted stool. If your pet struggles with loose stool or diarrhea, fiber may help to sop up some of the excess water sitting in their colon. Dietary fiber also acts as a binding agent and adds bulk to stool, which can encourage fuller, more frequent bowel movements in pets with occasional constipation or sluggish digestion. Because digestion plays such a critical role in health, keeping your hamster’s gut in good shape is an excellent way to lower their risk of health problems. Just remember that fruit is not a substitute for veterinary care. If your hamster has chronic constipation or diarrhea, take them to be examined by a veterinarian who can diagnose the underlying issue. Before feeding fruit to your furry friend, wash it thoroughly, remove any seeds, and cut it into small pieces. Give them small quantities at a time to prevent hoarding, and remove any fruit that your hamster has not eaten after a few hours. Hamsters will often hoard extra fruit, and it might grow mold if it is left sitting around in their cage. If your hamster is not already in the habit of eating fresh fruit, introduce it into their diet slowly. Start with a small quantity once or twice a week, wait to see how they handle it, and then increase it until they are eating a small amount of fruit every single day. Increasing your pet’s fruit consumption dramatically can cause upset stomach and diarrhea. If your hamster ends up with loose or watery stool after a hearty helping of fruit, give them less of it in the future. If their digestive distress does not improve, see a vet. Most types of fruit are safe for hamsters. Some of the best options include apples, blueberries, blackberries, cranberries, strawberries, grapes, peaches, pears, kiwis, and watermelon. Bananas and mangoes are safe for hamsters, too, but they should be limited due to their high calorie content—these more calorically dense fruits may make your hamster more likely to gain weight if consumed in excess. Avocados, while technically safe for hamsters, are not recommended, as they are very high in fat and calories. The only real risk associated with feeding fruit to hamsters is that they may gain weight if they eat too much. Fruit is higher in calories than most vegetables, and, because hamsters are so tiny, extra calories add up quickly. Obesity can put your hamster at an increased risk of conditions such as heart disease, insulin resistance, diabetes, and arthritis. If your hamster is already overweight or obese, talk to your veterinarian to find a good way to reduce their caloric intake. It may be helpful to opt for low-calorie fruits, such as watermelon and berries, when you want to give your hamster a treat. Steer clear of more fattening options like avocados. In conclusion, most fruit is safe and healthy for hamsters to eat in moderation. Fruit is high in disease-fighting antioxidants and dietary fiber, which supports healthy digestion. Wash and remove all seeds from the fruit you plan to give your pet, and make sure you only give them a small serving at a time—this will help prevent them from hoarding fruit until it spoils. Can Hamsters Eat Grapes? Can Dogs Eat Turkey?